From the New York Times bestselling author of the Tradd Street series comes a stunning new novel about a young single mother who discovers that the nature of friendship is never what it seems…. 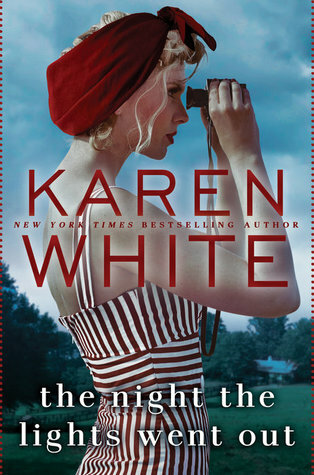 Thanks to the publisher I am thrilled to be able to offer a giveaway copy of THE NIGHT THE LIGHTS WENT OUT by Karen White! I’ve had her Trade Street books on my TBR list forever and this book sounds equally as good so I am super excited to bring this giveaway to all of my readers! Be sure to check out details about this book at the end of the post! This giveaway is for a paperback copy! A winner will be announced 4/10/18. From the New York Times bestselling author of Flight Patternscomes a stunning new novel about a young single mother who discovers that the nature of friendship is never what it seems…. Recently divorced, Merilee Talbot Dunlap moves with her two children to the Atlanta suburb of Sweet Apple, Georgia. It s not her first time starting over, but her efforts at a new beginning aren’t helped by an anonymous local blog that dishes about the scandalous events that caused her marriage to fail. In a town like Sweet Apple, where sins and secrets are as likely to be found behind the walls of gated mansions as in the dark woods surrounding Merilee’s house, appearance is everything. But just how dangerous that deception can be will shock all three women (summary from Goodreads). This book sounds good and I love how it’s set in Georgia! I love her books!!! I can’t wait to read this one and she has another one coming out!!! Thanks for the chance to win!